"Top priority is to enlist Doctor Who. He has advanced knowledge which WOTAN needs. 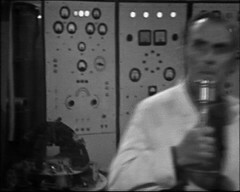 Doctor Who must be enlisted into our services tonight!" Brilliant again. 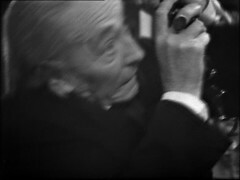 It's just superb watching the Doctor with normal people and doing normal things: just seeing Hartnell on the phone is a real delight! 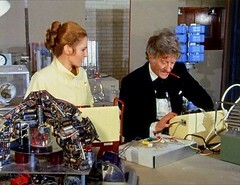 Of course it's using the telephone that causes The Doctor to be attacked by WOTAN. 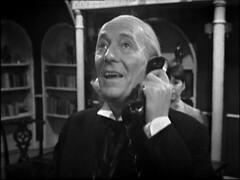 You'd think he'd learn from the experience and avoid them in future but he gets attacked again, this time by the phone itself, when using one in Terror of the Autons! 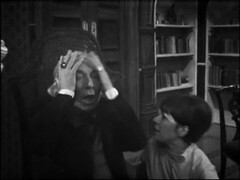 DODO: Don't be alarmed, Doctor. This is the method of establishing contact. Time is very short. Construction has already begun. You are needed. DODO: It's all right, Doctor. You are now one of us. My function was to bring you in contact. Now I shall serve as an assistant. DOCTOR: Oh, what are you talking about, child? DODO: Listen, Doctor, construction is taking place at strategic points in London. DOCTOR: What were you saying, my dear? DODO: But you took the call. You made the telephone call You made contact, didn't you? DOCTOR: It was if something enormous and terrific was trying to absorb me. Yes, yes, yes. Oh, it's ridiculous, child, isn't it? Yes, yes, yes, there's something erratically wrong with that telephone, yes. It was just like an electric shock. DODO: Then you received no instruction. DOCTOR: From whom, my dear? POLLY: Here you are, Doctor, drink this. DOCTOR: Yes, yes, thank you. DOCTOR: Stay where you are, my dear. POLLY: What is the matter? DOCTOR: There's a new and deadly danger facing us. Yes, and it's coming from Professor Brett's office. POLLY: From my office? I don't understand. DOCTOR: None of us do. Yet. Come here, my dear. Look at me. Yes, it's just as I thought. She's been hypnotised. Sit in that chair, my dear. DOCTOR: Now, I want you to repeat after me. My name is Dodo Chaplet. DODO: My name is Dodo Chaplet. DOCTOR: I resist all attempts to change me into somebody else. DODO: I resist all attempts to change me into somebody else. DOCTOR: Now, I'm going to start counting. And when I've counted up to five, you will be fast asleep. And when you wake again, you will forget all about this distressing incident. Now I'm going to start counting. Just look at that ring on my hand. 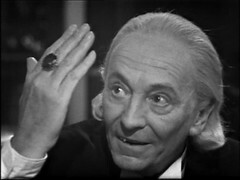 DOCTOR: One. Two. Three. Four. Five. Yes, I think she'll sleep for forty eight hours, and when she wakes I want absolute peace and quiet for her. Do you understand? POLLY: Are you sure she's all right? DOCTOR: Oh yes, she's all right. SUMMER: She can go down to my house in the country. My wife will look after her. DOCTOR: Yes, it's a very fine thing. Yes, and take care of her, won't you. 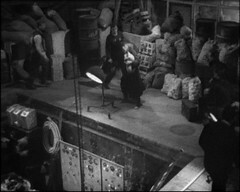 It's a fabulous scene, one of the best Hartnell has performed in three years and definitely the best thing Jackie Lane's Dodo has had to do: she puts in a great performance in her closing moments. It's a shame she's had to wait till her last two episodes for something to get her teeth into. Then all of a sudden she's gone. Off she goes to Sir Charles Summer's house to recover halfway through the story and we never see her again! Possibly the worst send off for any companion (but see Liz Shaw for a real competitor!) At just Seventeen episodes she's one of the shortest lived companions (Katarina was only in five and Sara Kingdom in nine) Even Bonnie Langford's Mel is in twenty episodes! 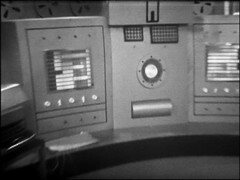 Dodo is also the first companion not to meet the Daleks so from almost every angle she's got a very raw deal! It doesn't go well for her in the rare occasions she's popped up in fiction since this story! Read the free ebook of Who Killed Kennedy? for one example! Polly (Wright, although that's never stated on screen) is Brett's secretary evidently designed buy the production team to be a with it girl about time and a slightly older figure than most of the female companions seen so far. 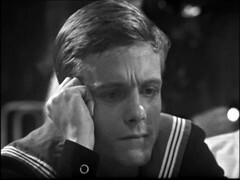 Ben Jackson on the other hand stick out like a sore thumb in the nightclub, almost as bad as the Doctor does. You get the feeling from what Kitty, the bar woman, says that he might have spotted Polly a few days ago and has been coming back ever since to try to meet her. 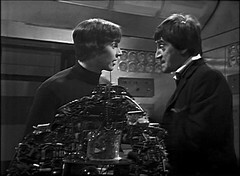 They are the most obvious couple to be associated with the Doctor since Ian & Barbara. 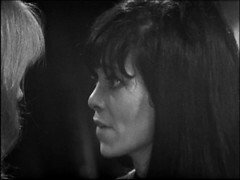 Both of the actors in question have family connections to the series: Anneke Wills then Husband, Michael Gough, appeared as the Celestial Toymaker while Michael Craze's brother Peter was a Morok rebel in The Space Museum. I know, you've tried your best to forget, I have too. They're not the only ones to have a family connection to Doctor Who. 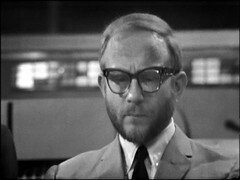 Professor Krimpton is played by John Cater who was married to Wendy Gifford, who will play Miss Garrett in The Ice Warriors, while William Mervyn, who plays Sir Charles Summerm is the father of current Doctor Who production designer Michael Pickwood. 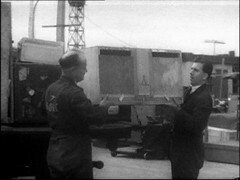 The episode features some stock footage of a plane loading and parts being unloaded to be taken to the Warehouse where the War Machines are to be constructed. 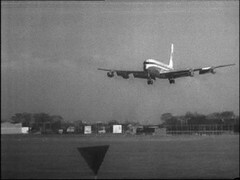 It's somewhat ironic that a plane landing should be shown in this story as on the same day as the action is taking place here The Second Doctor is at Gatwick Airport dealing with the Chameleons in The Faceless Ones. Planes aren't the only vehicles we see in this episode. 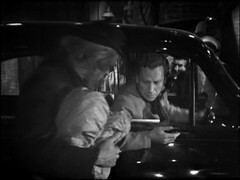 There's a taxi on set as the Doctor and friends leave the Inferno and then a van unloading the War Machine parts. We know the Van shot isn't stock footage because the boxes in the back of it are marked with W for Wotan and I'm pretty sure one of the workers standing there is the same one that was earlier waiting for the Doctor and later is the subject of the War Machines weapons test. 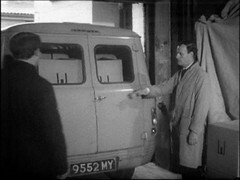 It's not listed as a location as such but my guess is the van had reversed into the studio at Ealing here. 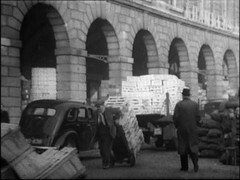 There's some brief filmed location work in this episode which helps set the scene: we see workers at Covent Garden Market and then Ben walking past the nearby The Royal Opera House both of which help to establish the general location of both the Inferno nightclub and the neighbouring warehouse where the War Machines are being constructed. 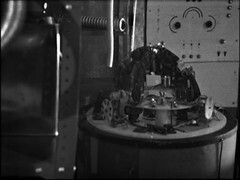 This odd shaped device previously appeared in The Space Museum and will return in The Wheel in Space, The Mind Robber and Spearhead from Space. Apparently it was originally constructed for the film the Curse of the Fly. Come back in two stories to see some more items in Doctor Who that have been re purposed from a feature film! 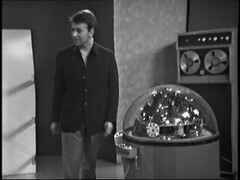 If you look carefully in the that second colour photo you can see another familiar Doctor Who prop: the Rel Counter from The Dalek Invasion Of Eath film! It's in the warehouse that we finally get to see the War Machines that give this story it's name. 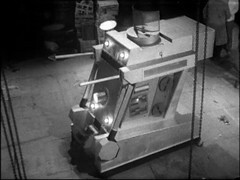 You could argue that The War Machines are something of a Dalek rip-off. 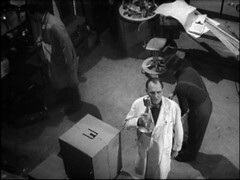 Notably their main weapon is a fire extinguisher like gas dispenser which is very similar to that used by the Movie Daleks. 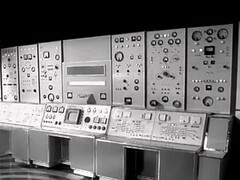 I think they're great, not so futuristic as to be out of place, but at just the right level of technology to look advanced in a sixties story. 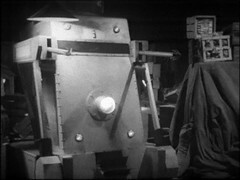 Note the similarity between the front of the War Machine and the design of WOTAN's central console. Gerald Taylor provides both the Voice of WOTAN and is the War Machine Operator. 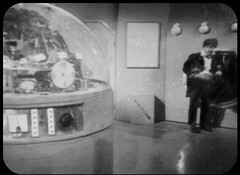 He's qualified for this second role by being a Dalek Operator in The Daleks, Dalek Invasion of Earth, The Chase, Mission to the Unknown and The Dalek Masterplan plus a Zarbi in the Web Planet. He'll return as a Dalek in Power of the Daleks and Evil of the Daleks as well as playing Damon's Assistant in The Underwater Menace episodes 1 & 2, the Baker's Man in The Dæmons episode two and Vega Nexos in The Monster of Peladon part one. He's also got an Out of the Unknown to his name as a Robot in The Naked Sun. There's a little slip up with the War Machine in the testing sequence in this episode: in some shots it's wearing the number nine, in others the number three. 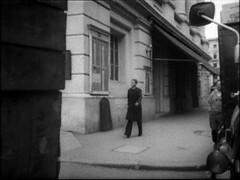 The nine shots appear to be those pre filmed at Ealing while the three shots are those recorded at Riverside Studios in Hammersmith. It's not the only continuity slip up between the two filming locations. We saw the mistake with the control panels above but seen in the Warehouse is a little electric truck, probably belonging to the scene shifters, like what we saw in the Ark. The problems is it's a different model between locations! 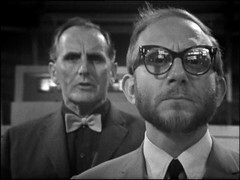 Two of the cast of this story later both reappear in the same Doctor Who story: John Harvey play Professor Brett here. 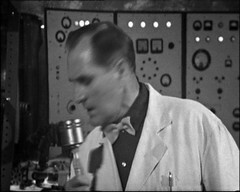 He's in The Macra Terror Episodes 3 & 4 as Officia. I looked on IMDB at his 45 year career and I'm almost appalled to say that the thing that really jumped out at me was an appearance in Rentaghost! 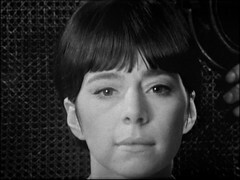 Also returning in the Macra Terror is Sandra Bryant, who plays Kitty the manager of The Inferno bar here. 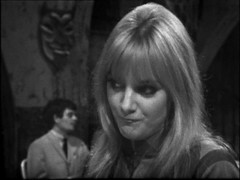 She plays Chicki in episode 1 of The Macra Terror but by the time the character reappears in episode 4 she's been recast with Luan Peters filling the role. If memory serves Bryant had been offered a longer job and asked to be released! 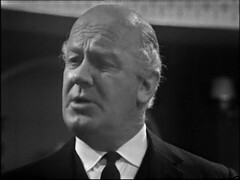 Major Green is played by Alan Curtis, who for many years was the announcer at Lords Cricket Ground. I thought that this job had earned him the honour of being the second Doctor Who cast member to get his obituary in Wisden, the Cricketers' Almanac. However when I went to look up his date of death, in order to trace which almanac his obit was in, I was rather surprised to discover that Curtis was still with us! You can hear him interviewed in Toby Hadoke's Who's Round 163. 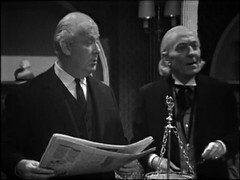 The identity of the first Who actor to get into Wisden may come as a bit of a surprise! Curtis isn't the only Doctor Who cast member to have been ground announcer at Lords either! Johnny Dennis, who played Murray the coach driver from Delta & The Bannermen, filled that role for many years and you can hear him interviewed in Who's Round 125. I didn't know until Toby Hadoke told me but Milton Johns from Enemy of the World, Android Invasion and Invasion of Time, has also done the job and you can hear him interviewed in Who's Round 136 and 137. 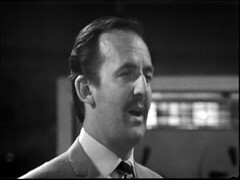 Of the rest of the cast worker Desmond Cullum-Jones has a Doomwatch appearance to his name as Patterson in their story called The Web of Fear while Michael Rathborne the Taxi Driver was in Quatermass II as a worker/zombie in The Coming and an Extra in The Frenzy. Finally IMDB has two credits for episode 3 for "Man in Market" that I think should be against this episode, from the scenes as Ben is walking through Covent Garden. 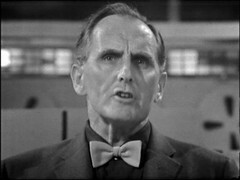 Of the two Geoffrey Witherick was previously a Cricketer / Reveller in Dalek Masterplan 8: Volcano and a Guard in The Massacre 4: Bell of Doom. He'll be back as a Villager in The Dæmons episode three and a Coven Member in The Dæmons episode four and five of the same story, a Guard in Frontier in Space episode two & three and a Security guard in Image of the Fendahl part two. 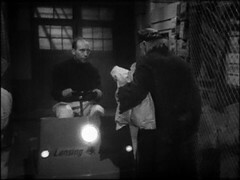 At the time of Ian Levine's visits to the BBC archives in the late 70s all four episodes of the War Machines were missing from the BBC archives. 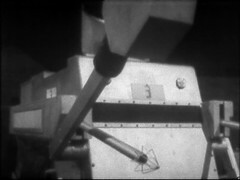 Episode 2 was returned from Australia having been acquired by a fan there. 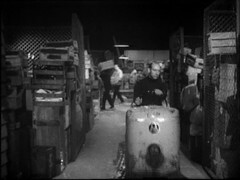 ABC television records in Australia indicate that this particular film print was destroyed: it's continued existence is something of a mystery and makes people wonder if any other "destroyed" episodes are lying in private hands like this one was.